This slow growing species is noted for its giant size (30 inches high by 66 inches high), vase shaped mounds of cupped blue-green foliage. The leaves are broadly ovate shaped, moderately corrugated and have thick substance. It has very tall (about 6 feet high) flower scapes with pale lavender blooms from late July into mid-August followed by some viable seeds. According to The Hostapedia by Mark Zilis (2009), "It has proven to be an outstanding, "impact" plant in the shade gardens throughout the U.S. H. nigrescens makes an excellent background plant and can be a magnificent focal point of an island bed." 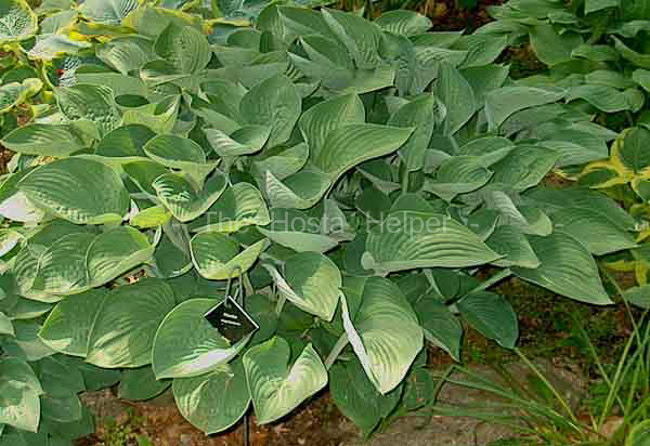 The New Encyclopedia of Hostas by Diana Grenfell (2009) states: "Moderate growth rate...Small hostas and other ground-covering plants can be grown at its feet...Shoots emerge darkly colored, almost black. Scapes tower above the foliage mound."